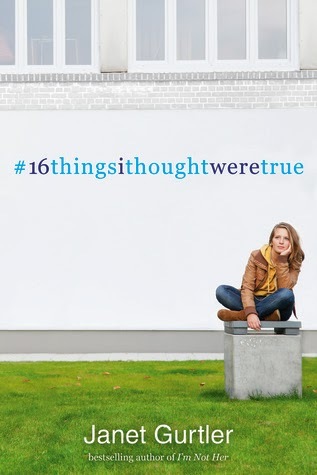 16 Things I Thought Were True is about a Twitter-obsessed teenager named Morgan, whose social life has fallen apart since her ex-best friend posted an embarrassing video of her that goes viral. It's also about Morgan's dysfunctional family, making new friends (Amy and Adam), finding the father she's never met by going on an impromptu road trip with aforementioned friends and the secrets they are all keeping. I should probably just say right now that I thought this book bit off far more than it could chew. Each of the different sub-plots were interesting in their own right but all thrown together made the book feel unfocused and underdeveloped. There's a lot of mystery surrounding Morgan's infamous viral video and it definitely made me wonder what the heck kind of video got posted (truthfully: not that bad). But I liked the focus on the Internet, particularly Twitter, because it was different. I don't see many books that mention Twitter and constantly checking and posting tweets, using hashtags and becoming friends online gets more common every day. The friends she makes "in real life" though, try to somewhat wean her off her Twitter obsession and I really enjoyed the bonds she formed with Amy and Adam. Amy, in particular, was a breath of fresh air with her candidness and positivity. She made me crack up more than once. And I liked Adam too. He was exactly the kind of guy Morgan needed in her life but their romance did feel kind of fast. I wish more time had been spent on the three of them as friends instead of the author introducing extra twists to Amy and Adam backstory. Both reveals felt unnecessary and out of left field. Now the whole let me just show up on my father's doorstep against my mother's wishes ended up being the biggest part of the book. I understood Morgan's desire to find him no matter what but the whole process of doing so felt off. She thought her father was dead and then finds out he's actually alive. One minute her mom is ready talk about him, the next she's acting like a crazy lady who's completely against the idea. Then Morgan decides to take this trip without any plans or ideas on what to say. Her father is rightfully shocked by all this. This is a huge moment and a complicated one for Morgan. But it wasn't written in a way that made me feel emotionally impacted by it. I kind of just read the words and thought "WHAT" to myself about a dozen times. Do I recommend? : No I don't. I really wanted to give it a chance but it was just all over the place. I really wish the author had simplified the story and focused more on a cohesive plot and developing these likable characters. 16 THINGS I THOUGHT WERE TRUE just sounds so... cute. I do like that it's integrated Twitter into its story! But it also sounds like it was kind of all over the place, which always bothers me if it's not done well in a book. Sadly, I've read a book by this author before and didn't really love it so... I don't think I'll read this one. I'm glad there were a few redeeming things about it though!